The news of Trump's server making interesting outbound connections caught attention of many security researchers in October 2016 and many of us, nerds, spent at least some time checking IP addresses, domains and looking at the logs. However, the logs that were kindly shared by Jean Camp brought more questions than answers. For example, we see a bunch of DNS lookups for the A records of MAIL1.TRUMP-EMAIL.COM , but not much more that would support the claims of the secret communications. 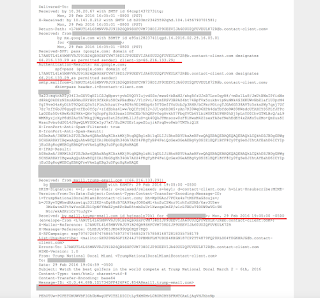 A number of researchers looked at it and wrote detailed explanations of why it is just a marketing email server, unlikely to be used for clandestine communications, and why the DNS log correlation with the political events seems very circumstantial. The fact that there was not enough information to make a final conclusion allowed that story to simmer until it flared up again in March, 2017 when Trump made allegations about the Trump tower wiretapping. The reason we are raising this story from the dead again is to provide additional evidence that the "Trump's server" used to be a marketing email server. We also offer our possible explanations to some of the events and question some premises and assumptions of the original disclosure. 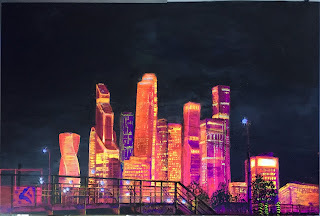 We may repeat a lot of good points made by Krypt3ia and Errata Security in order to turn this collection of events into to a more cohesive narrative. Disclaimer: We analyzed the email messages, the leaked logs, public DNS and IP information. We seek technical correctness and will welcome additional data. Conclusions that were made in this article were not driven by political opinions, we did not vote for Trump and do not have any interests in Alfa Bank. If you find technical or factual errors, please let us know in comments or email. The samples of email messages below show that the server was used for sending newsletter offers for at least 5 years and likely longer. We have a number of samples and mail logs of spam messages dated March 7, 2011-February 29, 2016. Please see below the email screenshots, list of subjects along with the partial string from each header, headers and screenshots of two messages. Before we go into technical details, here is a list of points in a Q&A form. Q: Did Trump or his associates communicate with the Russian bank via his server? A: The messages were sent from one DNS server (Alfa Bank) to another DNS server (Cendyn) asking for the IP address of mail1.trump-email.com. The leaked logs that contain these queries do not give enough data to substantiate such claims. Q: Does that prove <insert anything related to Trump's claims about wiretapping, Russian computer hacking, Russian ties, etc? A: Despite various wild theories, the events described in the original post and the logs have no relation to the Trump's claims that his wires were crossed tapped. This post does not prove that he "has" or "has no" other connections to Russia or anything about Russian hacking or other foreign entities. "The server " has never been the primary reason for the listed allegations. someone who wants to accuse the president in communications with Russia. A: "That server" is the same server we are talking about and it is not in the Trump tower. 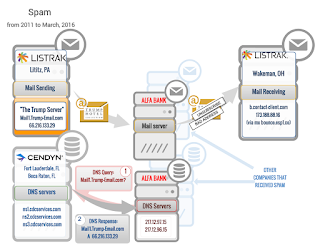 The server mail1.trump-email.com 66.216.133.29 was located in the Lititz, PA datacenter of a reputable digital marketing company Listrak contracted by Cendyn. Currently, the server with the IP address 66.216.133.29 is still in the datacenter and will be recycled for other needs. MAIL1.TRUMP-EMAIL.COM is pointing to a GoDaddy domain parking IP address (no actual server). TRUMP1.CONTACT-CLIENT.COM is still pointing to 66.216.133.29. Q: So, what happened then? 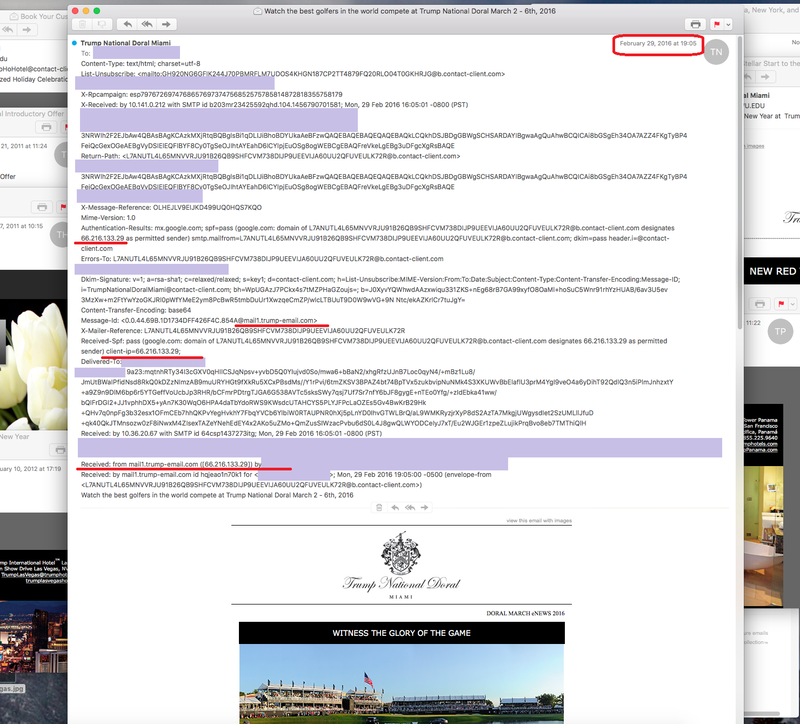 From at least 2011 to March, 2016, Alfa Bank employees and many other recipients around the world received so called marketing emails (aka spam) from Trump Organization sent from MAIL1.TRUMP-EMAIL.COM. 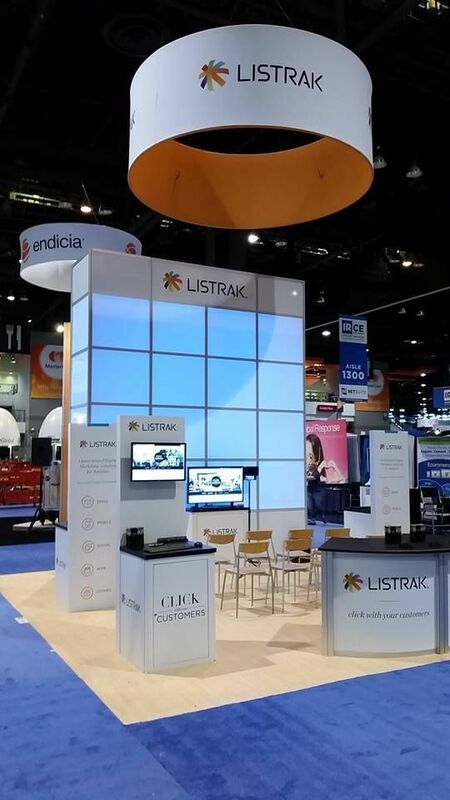 Digital marketing companies Cendyn and Listrak who provided the mailing services used their mail and DNS servers in Pennsylvania and Florida. Cendyn registered that domain for the Trump Organization, which already owns over 3500 domains (src. Domaintools). None of the servers were ever physically in the Trump's Tower. 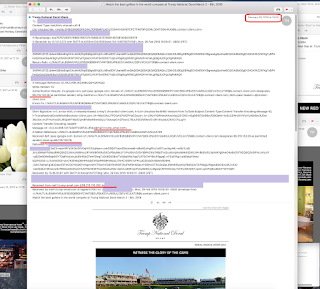 In March 2016, Trump Organization changed the vendor and stopped using Cendyn's services. 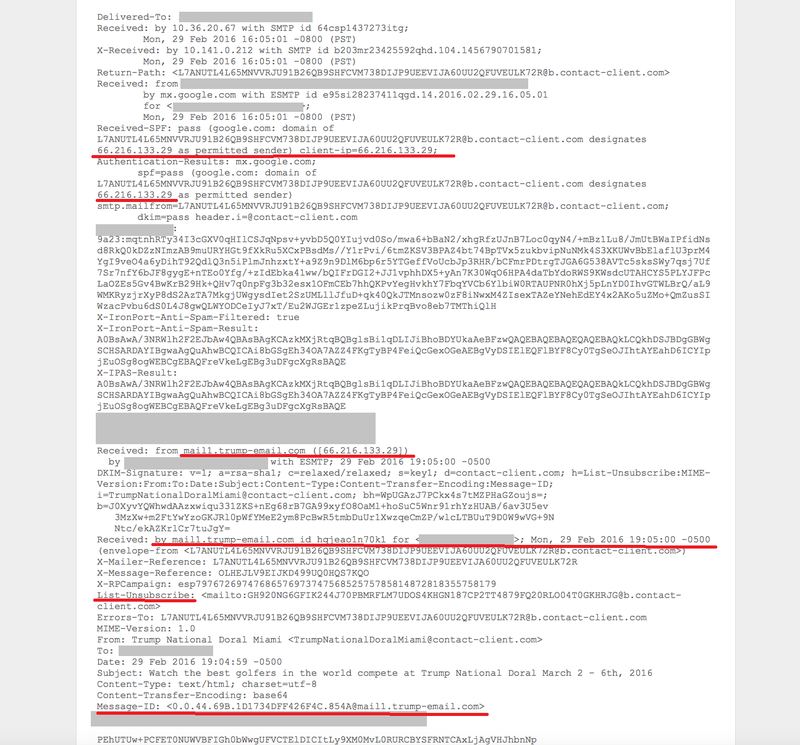 Since at least May 4, 2016 (earliest date in the logs), at least some of the companies that we believe received Trump spam in the past continued to make DNS lookup requests for IP address of MAIL1.TRUMP-EMAIL.COM. Alfa Bank and Spectrum Health made many more lookups than others. Other IP addresses belong to a quarantine appliance run by an Anti-Spam cloud filtering provider MailCleaner, eCommerce Corporation mail service, Australian company called Shiftcare (software for home care services), Hostedmail.com, DNS server for small business hosting. They did not directly connect to MAIL1.TRUMP-EMAIL.COM. In addition, it is believed many other companies were seen by various ISP providers doing similar lookups. source where they could come from. The logs span the period from May 4, 2016 to Sept. 23 2016 and contain DNS lookup requests made by Alfa Bank's DNS servers and the companies mentioned. Some IP addresses in the logs are not actual DNS servers but gateway IP addresses for those networks. Alfa Bank and other companies made daily (1-70+ a day) queries / DNS lookups asking for the IP address of MAIL1.TRUMP-EMAIL.COM that sent those spam emails, as seen in the email headers below. These DNS lookups for domains and IPs inside messages that are not incoming but already delivered may be caused by any of the following: misconfigurations or glitches on email and mail filtering services, security appliances performing automated or search triggered lookups (DNS lookups on existing blacklists etc. 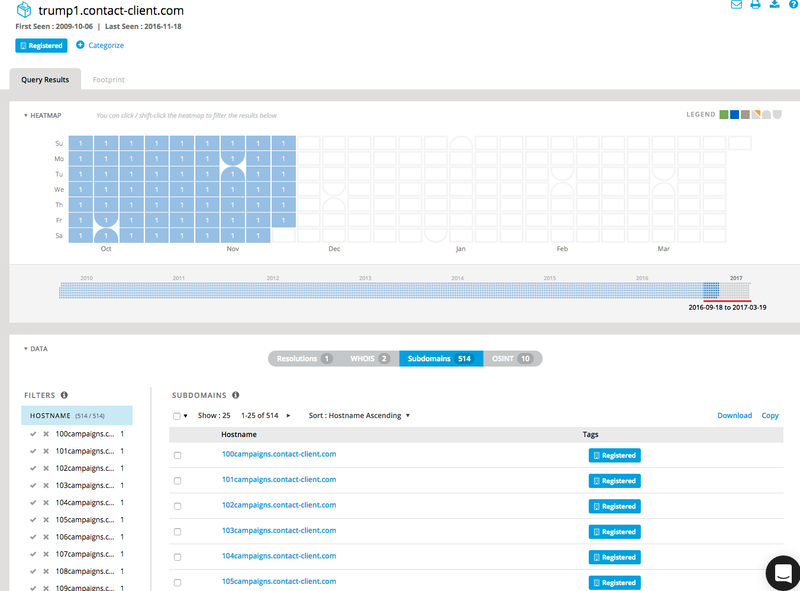 ), anti-spam mailbox store rescans, and endpoint level anti-spam products. For example, anti-spam systems are known to try to resolve and lookup every IP address and DNS name in the email message header, which can sometimes trigger unintended unsubscribe actions. For example, IETF Request for Comments RFC8058 "Signaling One-Click Functionality for List Email Headers" released in Jan. 2017 specifies rules for the broadcast marketing companies to help cope with unintended unsubscribe actions caused by anti-spam systems. The exact reason for lookups can be only guessed, since only the companies themselves would be able to tell which of their systems caused it, assuming enough associated internal logs were saved to correlate. 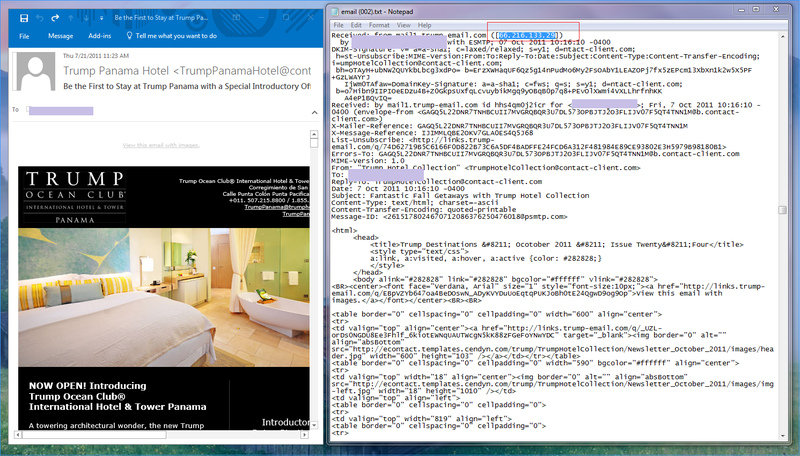 The reasons could be different for all companies - some of them made lookups for LINKS.TRUMP-EMAIL.COM as all URLs in the emails used that subdomain. You can see example of those links in the header examples and in these Tweetbot posts. 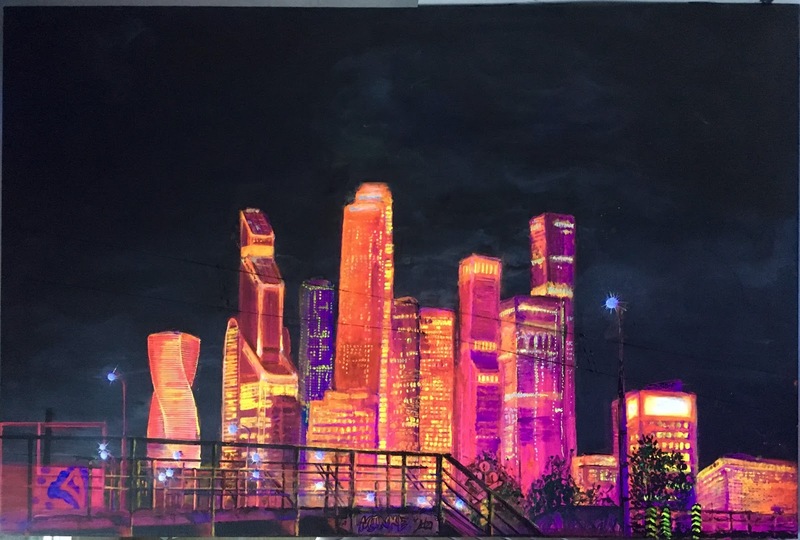 On September 21, Alfa bank was reached for comments about the logs, which caused the number of lookups and their variety skyrocket as their security team started the investigation. 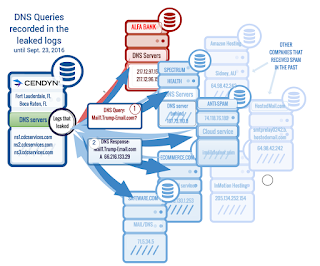 The author of the original disclosure states that the lookup errors started on September 22, 2016 because Cendyn removed the DNS zone for mail1.trump-email.com from ns1 and ns3.cdcservices.com. These were two Cendyn DNS servers in Ft.Lauderdale, FL. The second, ns2.cdcservices.com, is located in Boca Raton, Fl. Considering that Trump was not their client since March 2016, the hasty and belated removal was either co-incidence or reaction to being notified and realizing that the zone, or domain should have been removed long ago. Passive DNS logs show only when the subdomain is first seen, not when created or assigned. 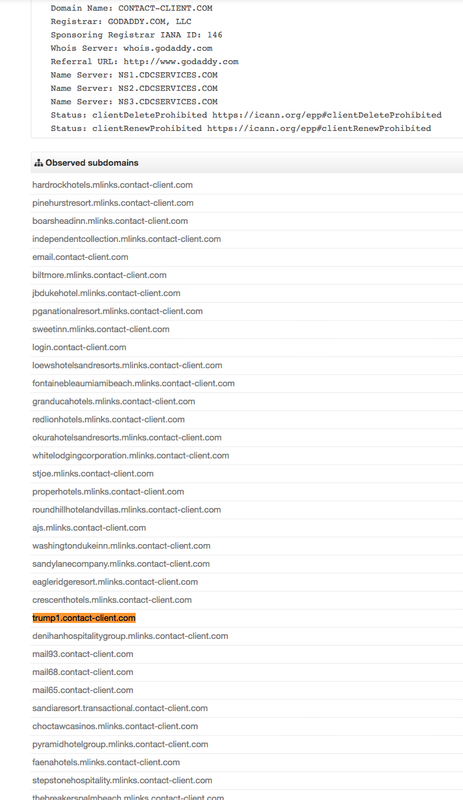 The fact that TRUMP1.CONTACT-CLIENT.COM showed up in the passive DNS logs on Sept. 30 could be attributed to testing if the server is reachable using the new (or existing) freebie domain (Cendyn creates them for each customer), especially if they indeed still used it for CRM software that "CenDyn provides to the Trump Organization". On September 27, Alfa Bank made a DNS request for the new TRUMP1.CONTACT-CLIENT.COM. Considering, that at that time the computer security department was performing investigation of the claims, it is not surprising. The domain was likely coaxed by various lookups and queries performed by their IT department. For example, you can see sudden appearance of queries for MAIL.TRUMP-EMAIL.COM (Mail without 1) from Alfa Bank 217.12.96.15 on September 22, which can be attributed to the investigation too. A: It is possible to send a lot of DNS traffic, or other requests and perform an attack (DDoS or other) without actually "hacking" the victim. They were not "hacked" in this particular case, in the sense of someone infiltrating their network, nor do they say that. 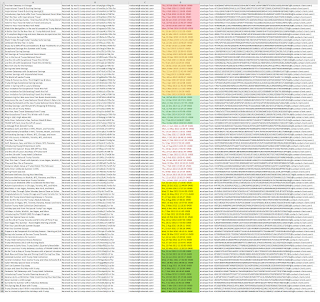 Alfa Bank received a lot of DNS queries and DNS replies to spoofed requests after the news came out. We are sure that many of those requests are the result of various researchers trying things. 1340 DNS queries is not a large number. And no, we didn't do it. While it is possible to spoof DNS requests and make them look like they came from Alfa Bank, it is not a convincing theory for events before September 23, 2016. 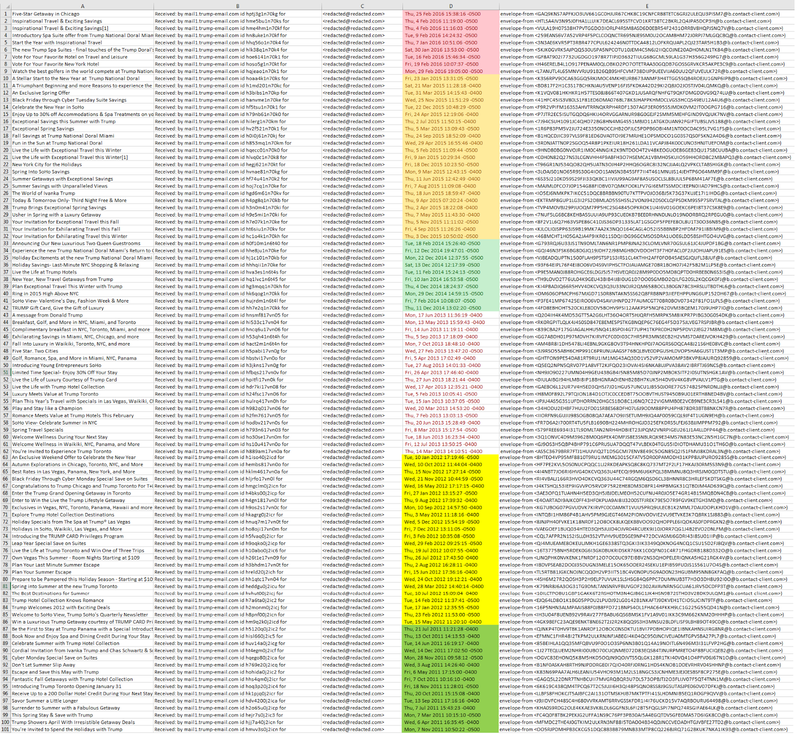 From the logs provided, there were 7 other companies seen over the course of 4.5 months doing the same type of lookups. We think the DNS spoofing attacks that happened in 2017 as reported by Alfa Bank were spurred by all the news about the mysterious DNS communications channel used by Trump and Russians. Many researchers and hackers would try all kinds of queries to elicit server responses and some possibly tried to make it look like the 'secret' communications continue. The evidence of those research efforts can be seen on the Farsight pDNS search for TRUMP-EMAIL.COM, where some recent entries include 'new' subdomains like you see below. The cause for these is the fact that TRUMP-EMAIL.COM uses a wildcard DNS record, so queries for its random subdomains will resolve successfully and show up in the database (if seen by any pDNS sensors). We should note that Cendyn transferred the TRUMP-EMAIL.COM domain to Trump Organization on March 8, 2017, thus all attempts to resolve the domain since that date would return the IP address of GoDaddy domain parking server. As it was already pointed out by many, the sever is located in a server farm that belongs to a hosting company and is one of many used by Cendyn (the company used by Trump Organization for mailing services). It is not more hidden than any server of any cloud services provider. You can see other servers with similar domain names registered by Cendyn in this 66.216.133.0/24 range (src. Hurricane Electric) and check out the domain siblings (Sibling domains are subdomains that share a common suffix which is not a public suffix. ) (src. Virustotal pDNS). 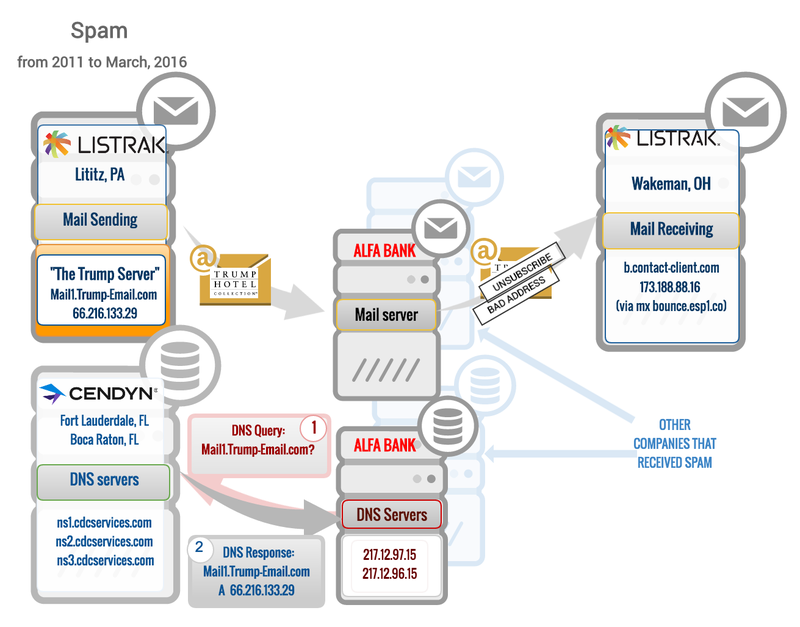 Robert Graham from Errata Security already explained that this is how Listrak configures email marketing servers. (src. Errata Security). SPF records for TRUMP-EMAIL.COM: first seen 2014-11-14 11:17:46 -0000last seen 2016-09-23 12:59:33 -0000trump-email.com. TXT "Internet Solution from Cendyn.com." trump-email.com. TXT "v=spf1 ip4:198.91.42.0/23 ip4:64.135.26.0/24 ip4:64.95.241.0/24 ip4:206.191.130.0/24 ip4:63.251.151.0/24 ip4:69.25.15.0/24 mx ~all"
Some spikes correlate and others don't. 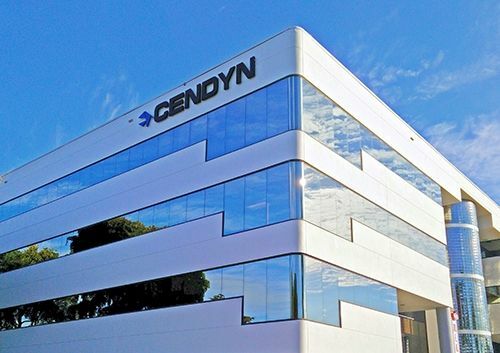 Cendyn is a marketing company, they do their best to avoid being blacklisted as it would undermine their business. It is possible they needed to use TRUMP1.CONTACT-CLIENT.COM after they removed EMAIL1.TRUMP-EMAIL.COM We do not know when it happened. We know when TRUMP1.CONTACT-CLIENT.COM showed up in the DNS logs and passive DNS database, but it is not a direct evidence of the creation and assignment date. This is correct. It appears that 66.216.133.29 was dedicated to Trump Organization. PTR records are still not updated. The server as machine on 66.216.133.29 in the Listrak datacenter is still up so it was not shut down. Passive DNS shows that "A" record MAIL1.TRUMP-EMAIL.COM was last seen on 66.216.133.29 on 2016-09-13. 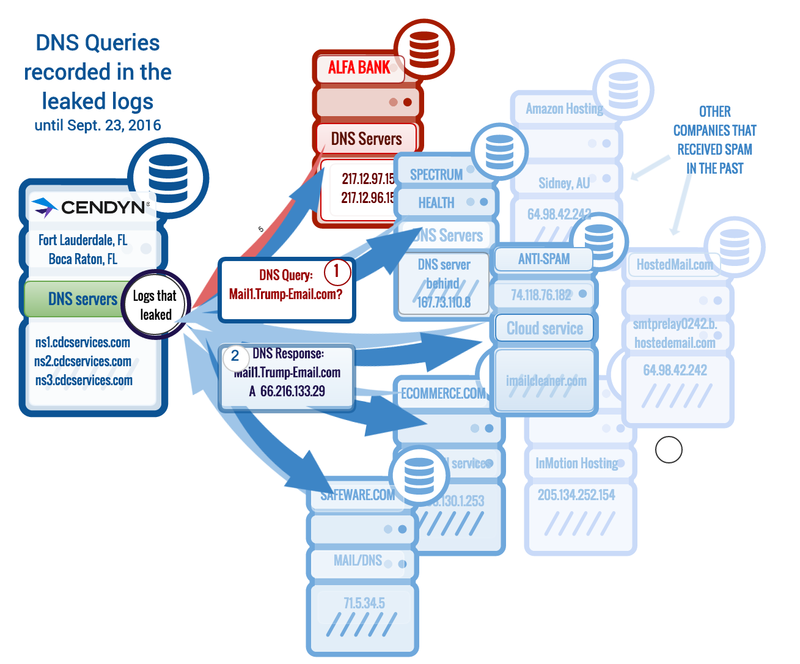 Since Trump company 'ditched' Cendyn in March 2016, eventual cleanup of DNS records had to happen - eventually. We don't know if they were contacted regarding the matter on or before September 22, 2016. If they were, it would be a normal knee-jerk reaction to the inquiry. They removed records only from the Ft. Lauderdale servers (NS1 and NS3) but not NS2 in Boca Raton (different admins?). It was noted by many that they also forgot to remove PTR record for mail1.trump-email.com and it is still pointing to 66.216.133.29 even though A record was finally assigned to GoDaddy domain parking 184.168.221.22 on March 8, 2017 (after transferring domain back to Trump org). Not sure what the author means by "an office communications channel". The requests for comments for the Alfa Bank were made on September 21, 2016. On September 27, 2016 the Alfa bank DNS server made a lookup for TRUMP1.CONTACT-CLIENT.COM. Considering that they did their investigation of the claims, it is not unexpected that their security people finally found and queried the other domain associated with the IP. Alfa Bank claims that the recent attacks in February and March 2017 are intended to make it look they continue the secret communications with the Trump server. 2017-02-17 According to the Alfa Bank press release on 2017-03-17, on 2017-02-17 computers in USA sent requests to "Trump Organization server" and made it look like it came "from various variants of MOSCow.ALFAintRa.nET", thus the "Trump's server's" replies were sent to Alfa bank.(src. Alfa Bank and Circa). The press releases often go through several layers of editing which could affect the technical accuracy of the text. 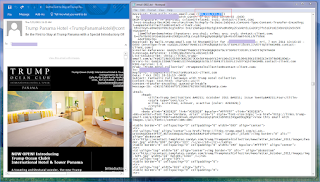 For example, here we can assume that by the Trump Organization server they mean Cendyn's DNS server for MAIL1.TRUMP-EMAIL.COM and that server received DNS queries for MAIL1.TRUMP-EMAIL.COM that came from Alfa Bank spoofed IP addresses. DNS servers do not record domain names of incoming requestors, so it is not entirely clear where they saw MOSCow.ALFAintRa.nET. Not questioning the fact of the attack but it is hard to say what happened without actual logs or more technical data. Again, it looks like press release is lacking technical accuracy, which is ok. In general, sending DNS request from spoofed IP addresses (crafted packets) is very easy. Often attackers use nonexistent subdomains to force their recursive DNS server to forward each of their queries to the authoritative DNS server for that domain instead of using cached answers, thus overloading it. DDoS does not seem to be the goal but more like malicious experimenting. In tech speak, epithets like "odd", "weird", "not normal" do not really mean clandestine or paranormal. These are highly technical terms meant to convey that existing evidence is too limited to allow one extrapolate the possible scenarios. I am not speaking for every comment out there but am suggesting not to jump to conclusions when a nerd calls something "odd". It would be beneficial, I think, to establish a timeline of the events that you see below and we will go over the milestones below. 2017-03-08 TRUMP-EMAIL.COM was transferred by Cendyn to "Registrant Organization: Trump Orgainzation Registrant Street: 725 Fifth Avenue Registrant City: New York"
2016-10-31 Slate Was a Trump Server Communicating With Russia? 2016-11-01 Errata Security Debunking Trump's "secret server"
2017-03 Snopes (Unproven) Trump Organization Computer Server Tied to Russian Bank?